Seat depth and width are important to insure a safe and comfortable experience. 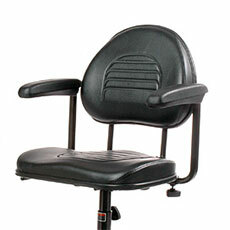 Seats that are too deep might rub behind the knees; too short and proper support is compromised. 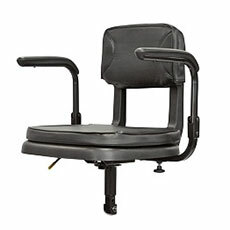 If the seat is too wide, you may not have adequate stability, especially when going around corners, but if the seat is not wide enough, you may have unwanted pressure on the sides of your legs. Let you raise or lower the height. Have arms that flip up or out of the way for ease of transfer. 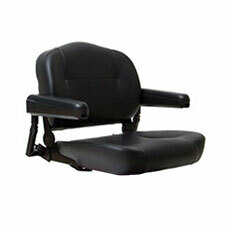 Some models have reclining seats, removable arms or arms with width adjustments to accommodate heavy winter clothing. 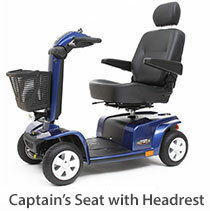 If you plan on frequent use of your scooter or extended excursions, consider adding a soft, supportive scooter cushion or choosing a model with a "Captain's seat" (sometimes referred to as an "Admiral's Seat"). 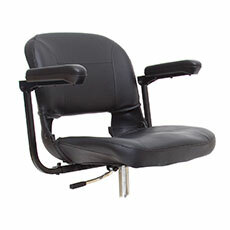 Captain's chairs have padding, contoured bases, height adjustable armrests, and sometimes head rests. They can be ordered in a choice of colors or fabrics and are available on some full-size and heavy-duty scooters. 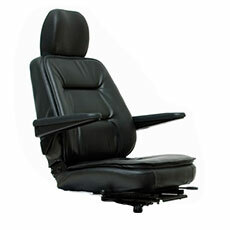 Another option is a power seat that can raise you up an additional 6 inches at the touch of a button. This can be very handy for reaching items, or sitting more comfortably at a table or counter. 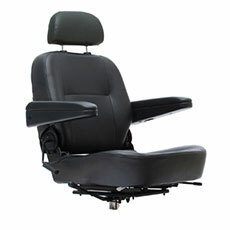 You can investigate and choose seats when you order the model you want online. Look for the Details and Specs or Accessories.